Perfect compatibility with iPhone 5! Published: 2013-05-10, by Ana Gracia. 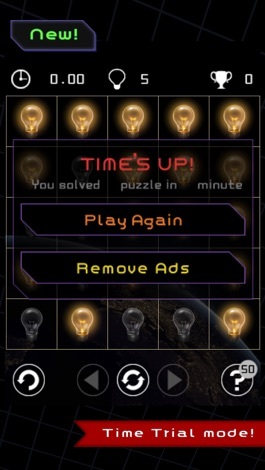 Tap to ON is a simple puzzle game for iOS in which the final objective is to light up all the bulbs appearing on the screen. You can play by yourself or with friends and family on the same device. 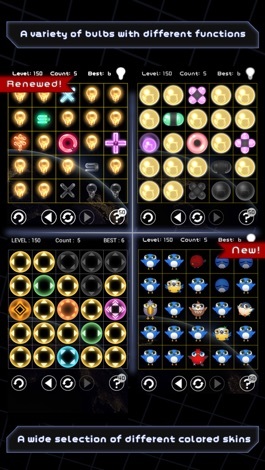 The gameplay consists on tapping the fewest buttons in order to light up all the cells, taking into account that there are different types of buttons which work in different directions. You need to find out the best way and use your intelligence and best strategy to solve each puzzle with the highest score ever. 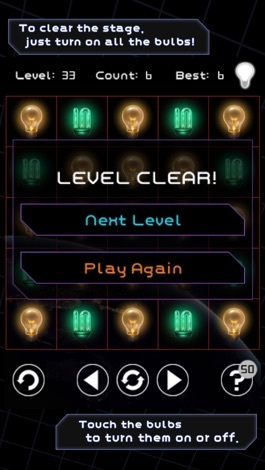 The gameplay is easy to learn and there are more than 800 levels, you probably won't find it short. gameday Inc. is the developer of Tap to ON, an interesting puzzle game with a simple concept that will make us think in every level. 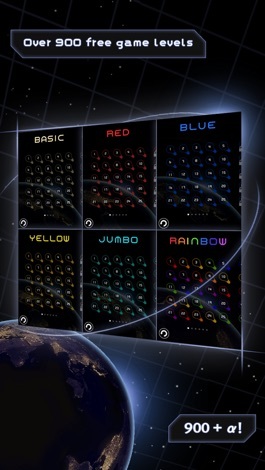 As you advance though the level packs, you will find new colors and designs which make the game much more complete and enjoyable. Tap to turn on the bulbs and brighten the world! A puzzle game that is simple, yet so engaging! A puzzle game for people of all ages! Play together with a buddy to double the fun! It’s also the perfect game for grandparents and grandchildren to play at family gatherings! 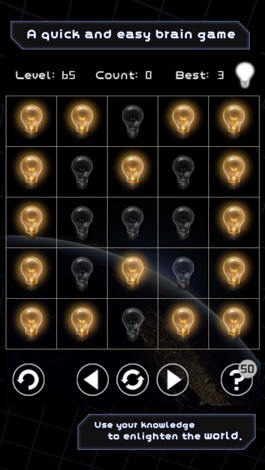 This game really challenges you to think and helps sharpen your intelligence! - Simple gameplay: It's easy and fast! - 900 game levels for you to play free of charge! - Did you clear all the free levels already? Try the 1,100 pay-to-play levels. - To clear the stage, just turn on all the bulbs! - Sounds simple, doesn’t it? Ha ha! - But you shouldn’t underestimate the complexity of this game. Try all our game titles.